I love maps! I was always fascinated with following the contours of coastlines, mountains, highways and imagining what it was like in those near and faraway places. That is part of the reason I chose an internationally mobile career. So when I saw this book in the Berlin airport, it immediately drew my attention. I am thoroughly enjoyed British author Tim Marshall’s book. I contemplate his takes on parts of the world and it allows me to fall asleep. The book is not boring, it just gives the reader lots to think about. 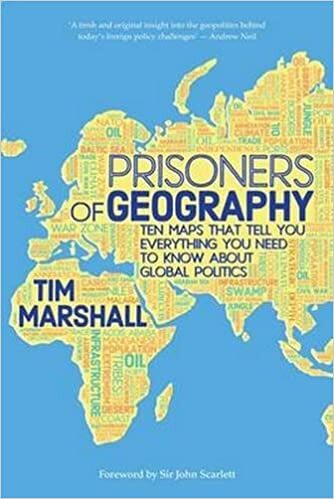 He is a former foreign correspondent for the BBC and Guardian and he really knows the 10 regions he features in the book. He focuses on how the landscape and geography drive government foreign policy. It is a course on global politics, history, culture through the lens of geography. Below are Marshall’s takes on the different regions and my insights. Middle East: This part of the world is dominated by desert and Islam. It is an area of conflict of varying levels. I think the big battle for control and influence are the Saudis and Persians, which also mirrors the split of Islam between the traditionalist Sunnis (85%) and Shia (15%). I didn’t realize that Iran was so big, and is larger than UK, France and Germany combined with 78 million people. It didn’t help that France and the UK drew up nations (Sykes-Picot lines) after taking control of the region from the Ottomans. The idea of nation-states is foreign here and most of the countries, examples include Iraq, Lebanon, Jordan, Syria, etc. bring together cultures and peoples that have an active dislike for each other. Israel is just a small part of the conflict that takes place in the region and the most important stories are taking place elsewhere in the region. I wonder what the place would look like if after WWI, they kept the “vilayet” system of the Ottomans, which was based on the traditional tribal territories of the region. India & Pakistan: This area is surrounded by ocean and a ring of mountains. The big conflict here in my opinion, is India and China. Yes, India and Pakistan have nuclear weapons and are enemies, but long-term, I never really thought of India being a rival to China. However, Marshall made me consider that perhaps with a larger and younger population, that this century, they will reach a level of economy that could counteract Chinese hegemony. I also gained a better understanding of the Pakistan and Afghanistan border region and why US forces had such a difficult time controlling it. USA: Marshall is optimistic about America and thinks with becoming self-sufficient in fossil fuels, a population that is not aging, a huge military and 17 of the top 20 research universities there, that America will be a global force for a long time. He also pointed out how fast the US grew, from the last colony of Georgia in 1732 to Alaska in 1867, the country grew at a tremendous rate. Western Europe: The region was blessed with a good climate, soils and navigable river so it was natural for it to develop to a high economic standard. The European Union has been good and kept the peace which is a region that has experienced many wars over the centuries. He is concerned that a breakup of the EU, could bring back those bad times. Africa: Three times the size of the USA, Africa has been hindered by rivers with waterfalls, malaria, no natural harbors and a huge desert in the north. All these factors slowed the growth of the economy. The concept of nation-states imposed by European colonial powers also hurts Africa even today. It was interesting to read the economic competition of the several power centers on the continent. These include Nigeria, Kenya, Tanzania and South Africa. Marshall also predicts a war between Egypt and Ethiopia over water. Japan & Korea: They along with the USA will always be close as common “enemies” of China and North Korea. Japan’s future is in doubt due to an aging population, which on pace to fall under 100 million by 2050 and under 50 million by 2100. Korea is a small, flat peninsula that was invaded by Mongols, Chinese and Japanese. Latin America will never reach the economic strength of the USA due to geography. Most of the people live on the coast, no infrastructure in the interior, and it is remote from most population centers (London is closer to NYC than Buenos Aires).